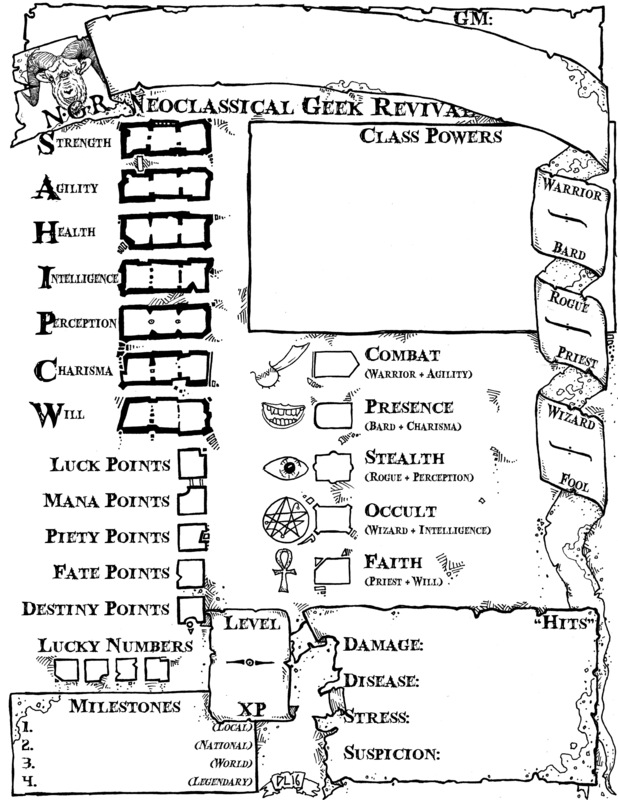 A new Neoclassical Geek Revival sheet! Two years ago, more or less, I decided that before I really got into trying out Zzarchov Kowolski’s Neoclassical Geek Revival RPG (which I had picked up at the Comic Book Shoppe here in Ottawa), I needed to… upgrade… the character sheet a bit. At the time I had a copy of the 4th edition, but Zzarchov informed that a fifth was underway so I did the sheet based on the new 5th edition of the book and it became the official NGR character sheet. It was also my first attempt at a much fancier style of sheet than the sheets I had drawn up to that point. I carried the style forward for a Labyrinth Lord sheet a couple of months later and to the Empire of the Petal Throne sheet I threw together for my own character in that game. Right now there is a new edition of Neoclassical Geek Revival being put together based on a lot of play by Zzarchov’s groups and under the layout of the incredibly talented Alex Mayo. So when I was asked over a game of Dungeon Crawl Classics a few months ago if I would be interested in doing the new official sheet, I jumped on it. The base design and structure remains the same as the one from 5th edition, but all the elements were redrawn, jiggered about with, and modified to the new rules set. Stylistically it is a bit darker than my last version, as I’ve changed my pen weights over the last two years and really enjoy good dark borders these days instead of the finer pen work I was working on when the last sheet was put together. I’ll probably redraw the back of the sheet next (or just stick with the existing back page, it works and has no text or rules material on it as it stands). Although all these crinkly paper edges make me desperately want to draw a new Advanced Fighting Fantasy character sheet – particularly after how much I disliked the one included in the new edition. I’d be happy to see one of your character sheets for The Hero’s Journey from James M. Spahn / Barrel Rider Games.